Kathy DeAngelo and Dennis Gormley are the husband-wife duo who have been performing traditional Irish music together in the Delaware Valley (South Jersey/Philadelphia region) as McDermott’s Handy since 1979. These talented multi-instrumentalists put on a super concert and combine their strong vocals and equally strong backing accompaniment with a commanding stage presence that comes from hundreds of performances in front of all kinds of audiences. With a huge repertoire they’ve built over 40 years of playing traditional music, they sing in Irish and English. Kathy mainly plays harp and fiddle and occasionally adds 5-string banjo and bodhran. Dennis plays guitar, flute and tinwhistle and can be counted on to add in mandolin or bouzouki when the arrangement requires. 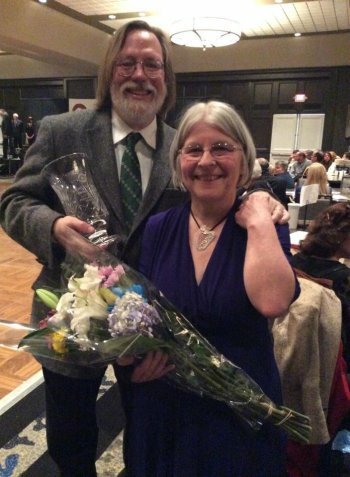 April 25, 2014: Kathy DeAngelo and Dennis Gormley were inducted into the Mid-Atlantic Comhaltas Ceoltoiri Eireann Hall of Fame at a ceremony that was part of Comhaltas Ceoltoiri Eireann's North American Convention at the Hilton Parsippany, Parsippany NJ. They join an illustrious list of traditional Irish music icons that includes Cherish the Ladies' Joannie Madden, uileann piper Jerry O'Sullivan, box player Billy McComiskey and legendary players of the past Ed Reavy, Andy McGann and Martin Mulvihill. 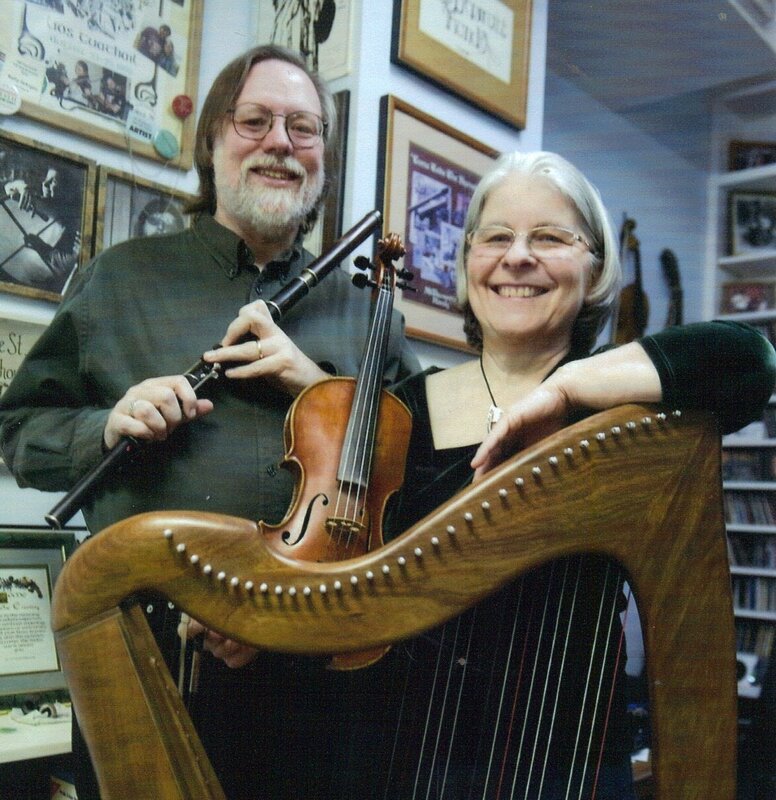 December 2, 2013: "For sheer impact on the De laware Valley’s Irish music community at large, the husband-and-wife duo of Kathy DeAngelo and Dennis Gormley has been a tour de force in promoting and perpetuating Irish traditional music for decades. The CCE-DV Branch nominated the duo for their work with the Next Generation Irish music program, the South Jersey Irish Seisiún, and for their many other Irish music associations and contributions." See the full announcement. Kathy has rhythmic, driving harp and fiddle styles, with the nuances of one instrument influencing the other. With a strong voice that belies her diminutive stature, she’s as much at ease with a heart-rending ballad as a rousing comedic song and has a special affinity for Irish emigration songs. She’s been playing and performing Irish music since meeting fiddler Ed McDermott in 1971; taking up the fiddle herself in 1976 and the harp in 1984. She’s been a catalyst on the folk harp scene since the early ‘90s. She co-founded the nationally-recognized Harpers Escape Weekend in 1991 and has taught at other harp conferences as well. 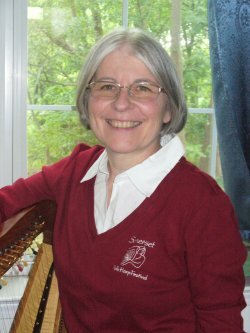 She took over management of the Somerset Folk Harp Festival in 2008, one of the premier harp events in the United States. 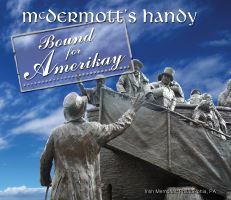 In addition to their two McDermott’s Handy CDs, Come Take the Byroads and Bound for Amerikay (released Aug. 2013), Kathy has produced and recorded the Harpers Escape Ten Years of Tunes and Another Ten Years of Tunes CD as well as published their companion music books of harp arrangements. To purchase those products, click here. Although he can play practically any instrument and any music style (and actually has worked and recorded in bands from bluegrass and country to jazz), Dennis is simply one of the most artful guitar players around. Whether it’s flatpicking a dance tune, finger-picking his way behind a song they’re singing or providing rhythm accompaniment to Kathy’s fiddle or harp playing, Dennis is a tremendously skillful and tasteful player. He is also the consummate flute and tinwhistle player as well with an incredibly large repertoire of dance tunes. Dennis is active in the Irish music community in the Philadelphia area and has been playing on the folk scene since the early ‘70s. In addition to anchoring a local weekly seisiun, he’s a sought-after accompanist for ceilis. He teaches Irish music on guitar, tinwhistle and flute both privately and in classes for Comhaltas Ceoltoiri Eireann. Dennis has recorded with many other artists in addition to McDermott’s Handy’s CDs, Come Take the Byroads and Bound for Amerikay. Copyright 2018, You Gotta Have Harp Productions.